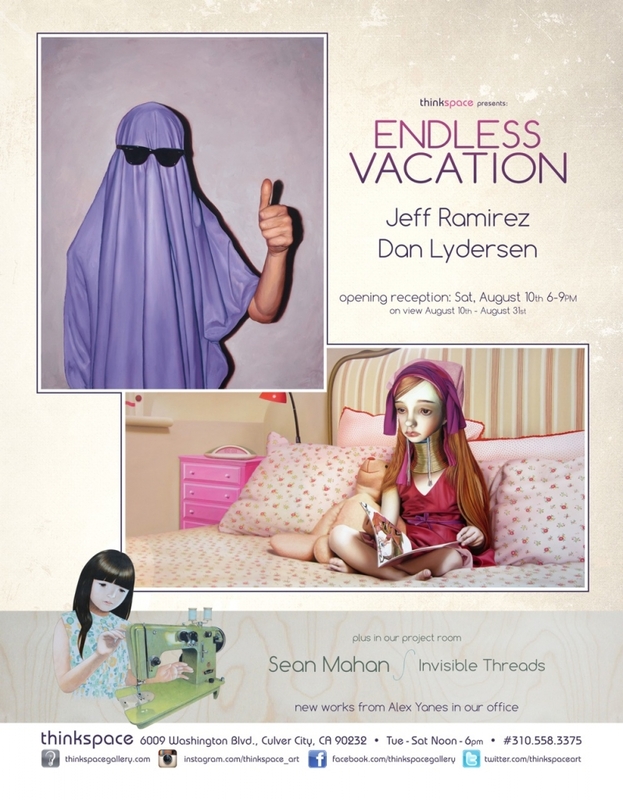 Thinkspace (Los Angeles) is pleased to present Endless Vacation, featuring new work by painters Jeff Ramirez and Dan Lydersen. Both artists work in a meticulously refined hyperrealist style, each uniquely their own, to conflate the distinctions between reality and staged experience. While Ramirez seeks to challenge the viewer’s cursory reading of photographic portraiture, challenging our expectations of the medium’s “truth” through unexpected stagings and interventions, Lydersen creates contemporary allegories that combine past and present with an acerbic wit and appreciation of the grotesque. Each artist intentionally attenuates the viewer’s belief in the veracity of the image by employing a style that denotes the “real”, set in sharp relief against content that forces an active reading of the image. Revealing the complex construction of the two dimensional plane through their manipulation and selective disclosure of content, both Ramirez and Lydersen create a visual tension and uneasiness in their work; one that activates the viewer’s awareness of the mediated nature of representation. Jeff Ramirez is a Los Angeles based painter working in photorealism. An early interest in the disjunctive nature of photography led the artist to create paintings that dealt with the suggestion of conflicted identity and unreliable images. His interest in the imperfection of representational photography and its inability to capture the subject wholly, inspired a critical approach to these photorealistic renderings. His paintings are so close to the “real” and yet convey an unresolved quality through an actively resistant subject that refuses to be entirely “known”. Using his own source photography to create uncannily “real” portraits, Ramirez explores the disassociation of the self from the gaze of the other and the photographic aperture. Often defiant, or repudiating, the subjects of the artist’s paintings are always slightly beyond our grasp. Whether it’s through a partially obscured view of the face, or a raised hand imperatively denying full access to their identity, the disinclination of the subject becomes a metaphor for the innate incompletion of the representational. In an age of rampant access and ubiquitous self-exposure, the artist reminds the viewer of the persistent obscurity of the self in face of the other. Dan Lydersen’s paintings combine the hyperrealist’s precision with the surrealist’s penchant for discord. His paintings combine historical and pop-cultural references to create compellingly provocative imagery. Clearly citing the historical precedents of allegorical painting, dating as far back to the Renaissance and even beyond to the medieval morality painting, Lydersen explores the medium’s history as a long-established vehicle for cultural meaning and spiritual excavation. By creating a palpable tension between the real and the construct, the contemporary and the past, the artist blurs their distinctions expertly. Lydersen is interested in the established role of painting as a view into the world and our cultural motivations. The viewer is left confounded, and at times disturbed, by the powerful juxtapositions tendered. The artist oscillates between blatant bombast and subtle revelation to keep the viewer searching for narrative fragments and the synthesis of unlikely interrelationships. Lydersen’s approach to painting actively explores its legacy as a heightened simulation of space, albeit an innately imperfect one, acting as a mirror unto the world and reflecting our deepest identifications, horrors, and angsts back into our sight lines.